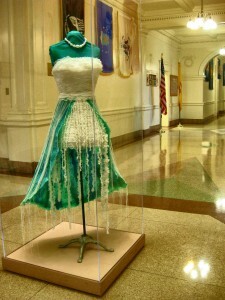 Nancy Judd has been exhibiting the Recycle Runway Collection in high traffic public locations around the United States for many years. The Recycle Runway collection has appeared in four international airports reaching millions of international travelers with Nancy’s message of environmental conservation. Nancy has also created site-specific installations using trash. Consumption was funded by New Mexico Arts, explores many aspects of the concept of waste. It’s fun to see such innovation – in artistic expression and message – amidst the trappings of State bureaucracy. Everyone who sees it is intrigued. The Jellyfish Dress also honors women in interesting ways, which pop out in a public art piece. I like the subversive ways it turns people on to creativity. Bravo!